Looks like Indian Market becomes very important for HTC. We’ve seen that almost all the phones that had been announced by HTC is now available in India. HTC One Series as well as budget phone HTC Desire C already make their way to Indian market. Now HTC Desire V that was announced earlier this month is now available in India for Rs. 21,999. The Online retailer Flipkart put the phone on sale for Rs. 21,999 with 1 year manufacturer warranty for Phone and 1 year warranty for in the box accessories. You’ll also get Free Sandisk 8 GB Memory card. 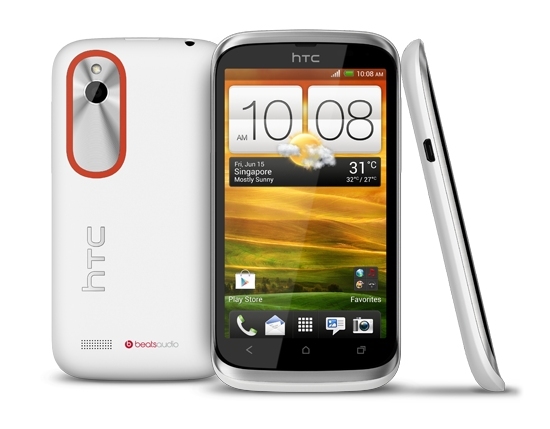 HTC Desire V has 4-inch capacitive touch screen display with 480 x 800 pixels, 1 GHz single-core Cortex-A5 Processor :( , 5 MP Camera and it runs on Android 4.0 Ice Cream Sandwich with HTC Sense 4.0 UI. The phone has 5 MP primary camera with Auto focus and LED flash. The phone comes with 512 MB of RAM, 4 GB of Internal storage with the support of microSD card (up to 32 GB). The good thing is that it supports Beats Audio. The phone is perfect for those who looking dual SIM Android smartphone with decent specs.